AFC Bournemouth lost 4-0 at Burnley as key moments proved costly for the away side at Turf Moor. The Cherries made a promising start but found themselves behind when Matej Vydra netted from close range - and before half time the lead increased through Aaron Lennon's low finish from a cross. A bright spot was provided by Junior Stanislas' comeback as a second-half substitute, and while the away team pushed for another comeback they were caught out twice by substitute Ashley Barnes, who first followed up a shot that hit the post to make it three and then finished off a pacey counter for a fourth. With Dan Gosling missing through a calf injury, Andrew Surman returned to the side in the visitors' only change, and starting with the captain's armband. The Lancashire afternoon noticeably colder than the weather left behind on the south coast, inside the first ten minutes the Cherries moved the ball around cleanly in the final third, Ryan Fraser seeing an effort blocked. Nathan Ake came within a lick of paint of an opener, a corner worked into the box and struck from 13 yards by the centre-back, the ball ballooning up off Ben Mee and coming back off the face of the cross bar. David Brooks tested 'keeper Joe Hart's handling with an curling shot, the away side looking dangerous when breaking as a fast counter soon ended with Diego Rico slicing a low strike wide. However, Sam Vokes had a clear opening for Burnley following a corner that made it all the way to the back post, the former Bournemouth striker unable to make a clean connection from three yards, Steve Cook diving in to block. Another slick break and Brooks fed wide to Callum Wilson who fired across and within a whisker of Joshua King, straining to make a goalscoring contact at the far post. Despite the Cherries' pressing play, Burnley took the lead in the 39th minute, some pinball in the away box falling finally to Vydra on his first start for his new club to lash home from six yards. Within a heartbeat it was two for Burnley when a looping cross in from the left dissected the defence and fell onto the boot of the stretching Lennon, a tidy angled finish finding the bottom corner as the hosts doubled their lead. The first half ended with the Cherries two goals behind at the end of a 45 minutes in which they were the better side for large spells. Eddie Howe brought on Simon Francis for Rico at the interval, the away side switching to three at the back with Adam Smith on the left as a wingback and Fraser on the right, Jefferson Lerma soon fizzing over the bar from range. Vokes swivelled to fire Matt Lowton's bouncing cross wide, at the other end Fraser's low effort blocked after Lerma picked out the Scot in the box. The Colombian soon saw his own shot saved by Hart, while Brooks came close to a first goal for the club, breaking into the area and looking to beat Hart with power from an angle, only for the 'keeper to make a fine save and divert behind. With 24 minutes to go Stanislas made his return from injury, replacing Wilson, Jermain Defoe introduced next with the Cherries final change. The away side were forcing the pressure but were hit by a third goalscoring blow when Barnes netted a Burnley third. Johann Berg Gudmundsson's initial effort deflected off a defender and onto the post the ball falling kindly for Barnes to tap home from six yards. 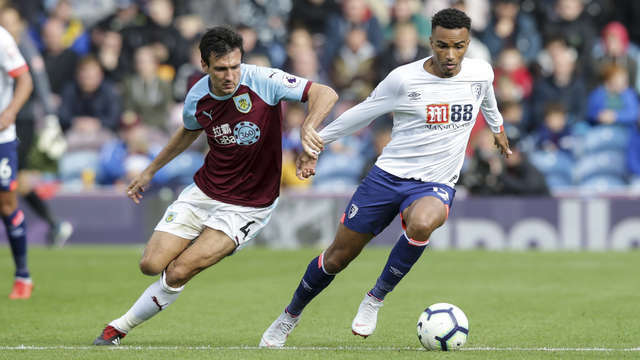 Bournemouth resumed their push, but were hit on the break as Burnley notched a fourth, Lennon turning provider as substitute Barnes coolly slotted home his quickfire second. The game came to a close with the Cherries drawing a blank and falling to defeat for the second time this season. For the majority of the opening period Bournemouth looked the greater threat, breaking with pace and finding pockets of spacing due to swift passing, Fraser usually at the heart of things. However, the one-two sucker-punch served up by the Clarets towards the end of the half once more meant the Cherries would need to fight back to claim any part of the points, leaving space in defence as a result of the goal search. A full 175 days after limping out of the action at Watford last March, Stanislas' return brought some positivity to the Cherries' second-half search for a way back into the contest at Turf Moor. The winger was close to converting Fraser's cross at the back post and played both centrally and on the right as the visitors searched for a way back into the game, and came close to a trademark strike from a free-kick which Hart saved.